Produced by GLOBE VIDEO FILMS and released February 2002. 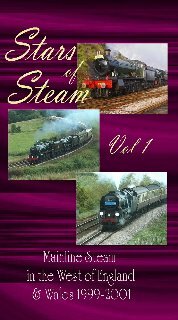 Stars of Steam Vol 1 features the highlights of mainline steam runs in the West Country & Wales over the years 1999-2001. As always, special attention has been given to acquire dramatic video footage so as to show these wonderful machines at their best. Dawlish Donkey specials over the years 1999, 2000 & 2001 also feature. Running time is 66 minutes and filming and editing is entirely digital thus guaranteeing a high quality product.